Although the Newsletter is a bit late this time it is indeed still in good running order. We have secured an editorial assistant, at least for part of the year, to help out with paper work, and our task in getting the Newsletter out has been considerably simplified. After this issue things should settle down so that the next Newsletter can appear at the normal time. The next issue of the Newsletter will carry an index to Volume 11 by Robert Kolker. 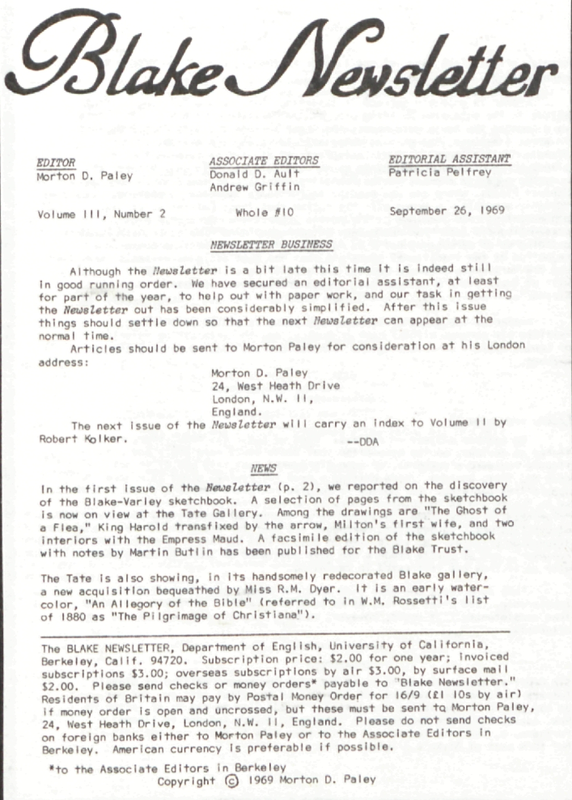 The BLAKE NEWSLETTER, Department of English, University of California, Berkeley, Calif. 94720. Subscription price: $2.00 for one year; invoiced subscriptions $3.00; overseas subscriptions by air $3.00, by surface mail $2.00. Please send checks or money orders*↤ * to the Associate Editors in Berkeley payable to “Blake Newsletter.” Residents of Britain may pay by Postal Money Order for 16/9 (£1 10s by air) if money order is open and uncrossed, but these must be sent to Morton Paley, 24, West Heath Drive, London, N.W. 11, England. Please do not send checks on foreign banks either to Morton Paley or to the Associate Editors in Berkeley. American currency is preferable if possible.